On April 13 2011, at our 100 day mark, we put out a list of 100 things that we wanted to do as Florida residents. See the original post here . We thought it would be interesting to see what we’ve done so far- our comments will be in blue. We’ll cover #1-50 today, and #51-100 tomorrow. 1. Resort hop. We have only ever stayed at POR-Riverside as a family, and we really want to experience each resort on property. So even though our current goal is to live 20 minutes away from Walt Disney World, we plan to do weekend stays at each resort, over the course of a year or two, and really take in the charm and uniqueness each resort has to offer. Nope not yet. This is something we still want to do. 2. Enjoy a Dole Whip 🙂 We’ve enjoyed them at Magic Kingdom but we still want to experience them at the Polynesian where you can disperse your own. 4. Attend Mickey’s Very Merry Christmas Party No, we haven’t, but between the two parties we’d prefer to do the Halloween party first, as you can experience most everything the Christmas party offers on the week leading up to Christmas on a regular day in the Magic Kingdom- well except for maybe the hot cocoa and cookies! 5. Go on a Disney Cruise! Right now with living in Wisconsin, the price of getting to the cruise has been a huge obstacle for us. We’re of the mindset that if we’re going to spend that much money, we’d rather spend it at WDW! Cruises are really very reasonable as long as you don’t have to travel over a thousand miles to get to one. Nope, not yet but still in the works! 6. Explore Animal Kingdom Park. There are so many areas of AK that we have not discovered simply due to the intense Florida heat, or lack of time available to us. We have done the basics, such as Expedition Everest, Kali River Rapids, Festival of the Lion King, Nemo &amp; Friends and Kilimanjaro Safari, just to name a few. (There are more). But it seems that there is so much more to Animal Kingdom to take in, and we are looking forward to being able to do that in the cooler Florida months, when we have the time to dedicate to it. We have not explored all that Animal Kingdom has to offer, but we have done more. We find the cooler months are the best times to visit Animal Kingdom, and we tend not to even go in the hot, summer months. Jen will be touring the backstage areas on Thursday through a special promotion with Disney Parks Blog, so check back later in the week for a special post detailing that. 7. Go to Magic Kingdom in the evening just for the parades We have not done this, primarily because although we only live 25 miles from the Magic Kingdom, it takes us approximately 45 minutes to reach the parking lot, and another 15 minutes or so for monorail/bag check time. With the cost of gas prices, it is not cost efficient to travel two hours just to attend a parade. 8. Have brunch at Chef Mickey’s 🙂 One of Ben’s favorite spots to see his buddy Mickey! 10. Start a new tradition of celebrating birthdays at Walt Disney World This a wonderful perk of living so close to Walt Disney World. 14. Have lunch at Le Cellier Yes, one of our favorite places to eat in Epcot. 17. Go to Sea World A few times- we especially love the new Antarctica attraction. 18. Explore the beaches of Florida–kids have never been to the ocean before. We plan to go to both sides of Florida: The Gulf of Mexico and the Atlantic Ocean Yes and yes. We’ve been to Anna Maria Island and Treasure Island on the Gulf side, and Cocoa Beach on the Atlantic side. 19. Dinner with Amy and Craig Petermann No, it never worked out. 20. Being able to meet Facebook friends who do not live in Florida but come to Walt Disney World on vacation. Shelley Urick Jones , we look forward to meeting you! This is another awesome benefit of living so close to Walt Disney World, the ability to meet up with our Facebook friends! There are too many to mention here, but we love meeting up with you all! 21. Lou Mongello’s WDW Radio Meets of the Month We have been to some! 22. Exploring the city of Clermont and getting to know our new home city Yes we know our way around fairly easily. We really like the area and enjoy living here. 23. Spending time in the Parks with Stephen and Judy Demeritt We always enjoy spending time in the Parks with our friends. 24. Meeting Marilyn Johnson in person! Marilyn and her husband Dan were extremely gracious and made us feel very welcome after we first moved to Florida. We’re blessed to have met them. 25. Go to Gatorland Still on the bucket list! 26. Enjoy the Osborne lights at the Studios as many times as possible These are incredibly awesome and guaranteed to instill the Christmas spirit in you! We do try to go as many times as possible during the season. 27. Enjoy making new friendships with all our Facebook friends who live in Florida Absolutely! 29. The various shopping opportunities, not only at Walt Disney World, but at the many outlet malls in Orlando and the surrounding areas. Ikea! Yes, IKEA rocks, and we love being able to visit any store we want to within a short driving distance. We have discovered a few Disney Outlet Stores in the Orlando Area, which can be hit or miss on the merchandise available, but definitely worth checking into it. 31. Day trips to explore Florida: cities in particular that pop into our heads for no particular reason are Tampa, Naples, St. Augustine, and Jacksonville. We have not yet had any day trips, but two that may happen in the next year are St. Augustine for the historical aspect of it (another field trip!) and Naples…..can we say Culver’s! Ok, that is not the only reason to visit Naples, but it’s definitely an incentive! 32. Shelling at Sanibel Island We have not done this yet; we have heard it’s not as good as it was in years past, but we would still like to visit. 34. Taking in Bob Jackson’s show at the Port Orleans Riverside resort! We haven’t, but the main reason is the noise level is just too unbearable for Ben. He has noise sensitivities and he can’t tolerate it. 35. Staying at the Port Orleans Riverside resort for old times sake! Definitely on the want-to-do-list SOON! We have eaten in the food court a few times. 36. Christmas shopping at Downtown Disney Every year- we love the atmosphere at Downtown Disney! 37. Riding down the Sassagoula River from Port Orleans Riverside to Downtown Disney (and vice versa) No not yet. 41. Resort hopping at Christmas to see all the different Christmas decorations This is in the plans for this year. We have been to the Grand Floridian, to view the Gingerbread House and the Christmas decorations, which are incredible. 42. Counting garbage cans to make sure the Demeritts caught them all 😉 No. 43. Trying on every hat that is sold on Disney property We’ve given up the practice of trying on hats, after a cast member friend of ours mentioned how everybody tries on hats and do you really want to put something on your head after hundreds of people have put it on their head? Um, no. 45. Enjoy a carrot cake cookie No, but we have enjoyed a Butterfinger cupcake. Actually it was too rich for our tastes, would not buy it again. 47. Dinner, lunch and/or breakfast with Lou Mongello Not yet, hoping to one day! 48. Movie at the Downtown Disney AMC theatre We saw Wreck It Ralph there before it was released, courtesy of a special meet-up with Disney Parks Blog. 49. Trying all 500 flavors in the Coke Freestyle Dispenser Not all the flavors- that would take gobs of money & tons of time. 50. DisneyQuest We love DisneyQuest. It was the main reason we renewed our premium passes this year. Categories: Attractions, Birthdays, Celebrations, Christmas, Clermont, Disney, Disney Quest, Downtown Disney, Entertainment, Florida, Food, Friends, Halloween, Holidays, Homeschool, Meets, New Fantasyland, Orlando Area, Theme Parks, Travel, Weather | Permalink. Welcome to the Month of Our Blog! We’ve been a little lax in posting here-ok, more than a little!- so we want to try to make that up in November. One of the reasons for doing this is to show the realities of making a long distance move to Florida, the good and the bad. It’s hard to give a honest evaluation after the initial move, because everything is just too new. With the onset of November, we are entering our 28th month of life in Florida, and it is just now that we feel that we can offer a fair look at the similarities/advantages and difference/disadvantages that we have personally experienced. Check back every day for a new point of discussion. Some posts will be longer than others, but when taken together, we hope that it will provide future Floridians with a long-term perspective of life in the Sunshine State. If there’s a topic you want us to cover, just leave a comment and we’ll be sure to address it in a future post. 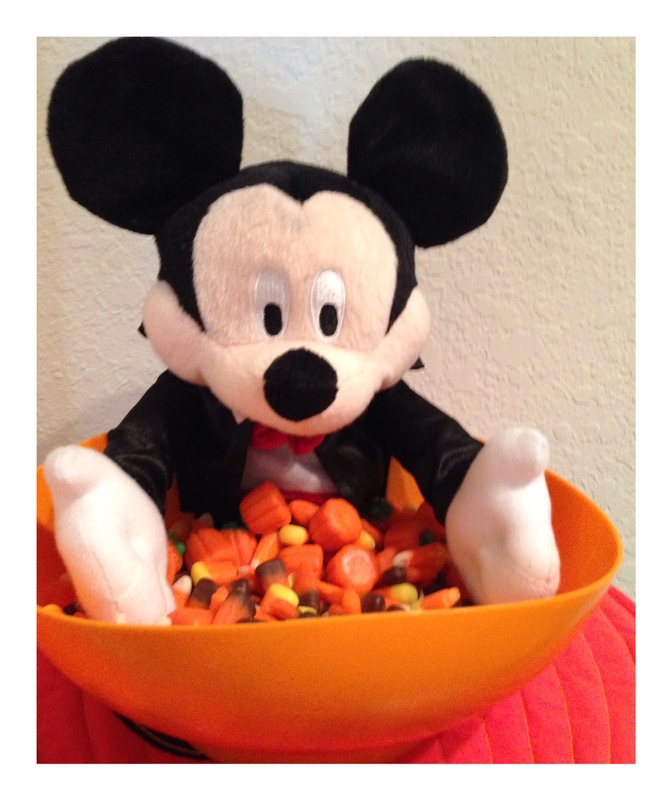 Happy Halloween to all our readers! Tomorrow is November 1st, and we have dubbed it the “Month of our Blog”. We plan to post every day in November, and will end the month with a special Christmas giveaway! Enjoy your festivities tonight, and be sure to check back tomorrow! Kevin W, the winner of our giveaway. Please check your other folder in Facebook messages; we will also attempt to contact you via email. A big thank you to all who entered! It’s hard to believe that two years has passed since we first left Wisconsin! But it has, and here we are. We wanted to mark the day with a giveaway for our readers, as without your support and friendship we don’t believe we would have been successful in achieving our dream. We intend to blog later about how life is 2 years later, but for now, we are giving you the chance to win! Thanks to the gracious folks at PassPorter, we are giving away two books: PassPorters’s Walt Disney World 2013 and PassPorter’s Disney Cruise Line and its Ports of Call. But…. we were at the Emporium in Magic Kingdom, and we thought wouldn’t it be cool to add a couple extras? 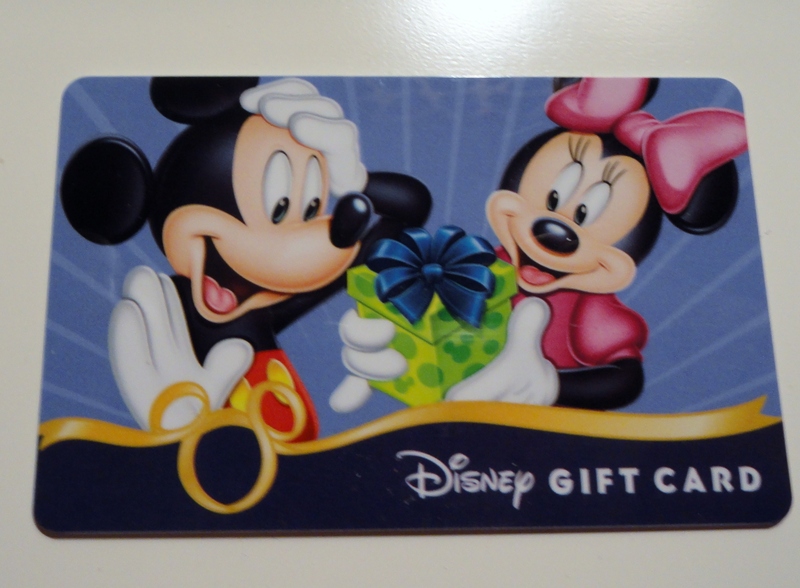 How does a $10 Disney Gift Card Sound? 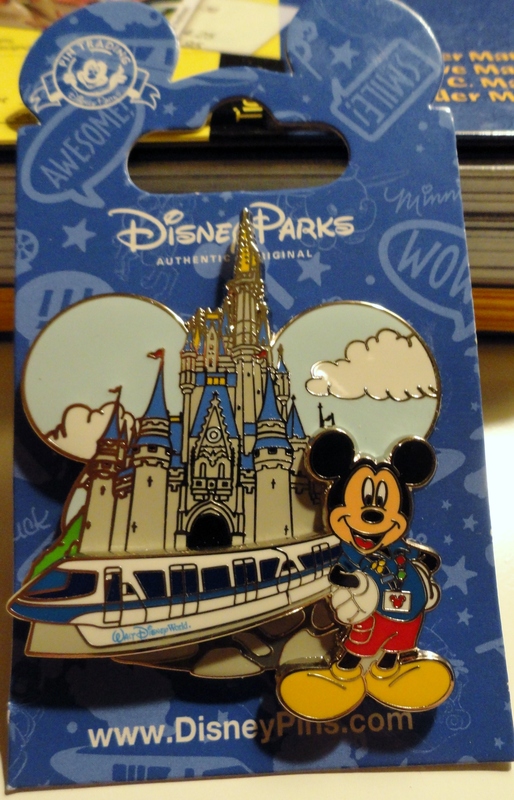 And who can resist Mickey and the Monorail and Cinderella Castle? This is such a cute pin! Please click on the Rafflecopter link to enter the giveaway! One lucky reader will win all of these items! Categories: Floridaversary, Giveaways, Moving | Tags: Floridaversary, Giveaway, move to florida, moving to florida | Permalink.